Have you ever wondered how a couple of doctors, nurses and other medical staff are able to manage and handle a patient population that is more than half their number? The medical staff to patient ratio is set to a minimum of 1:20. This means that every nurse in the hospital takes care of 20 patients per shift. That’s quite a lot, but they were able to manage with the use of care plans. Care plans have been used by medical practitioners for a very long time, which made it possible for them to provide the care needed by their patients. It is widely used in the hospital setting, and extends to health care centers in small towns or remote areas. 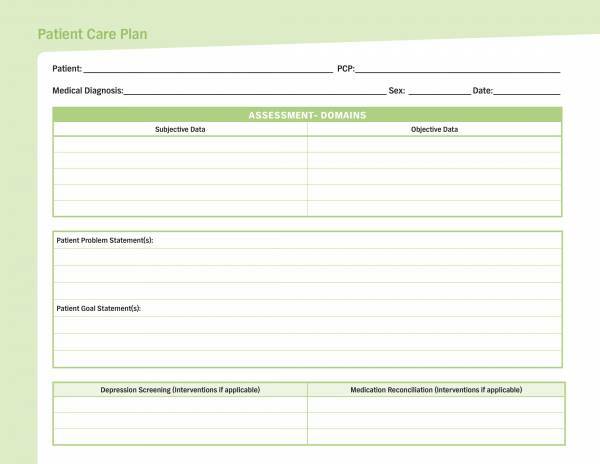 Let us learn more about patient care plans using the samples and templates provided here as our reference. What Is a Patient Care Plan? Doctors, nurses and other medical staff take shifts in order to provide 24-hours of holistic care to their patients in the hospital, or even in the care facilities outside of hospital. This is such a huge and difficult setting if not managed properly. There surely will be problems with communication among the medical staff and the care provided to patients may not be enough. However, this has been a problem of the past as it has been resolved by what is popularly known in the care facilities as patient care plans. 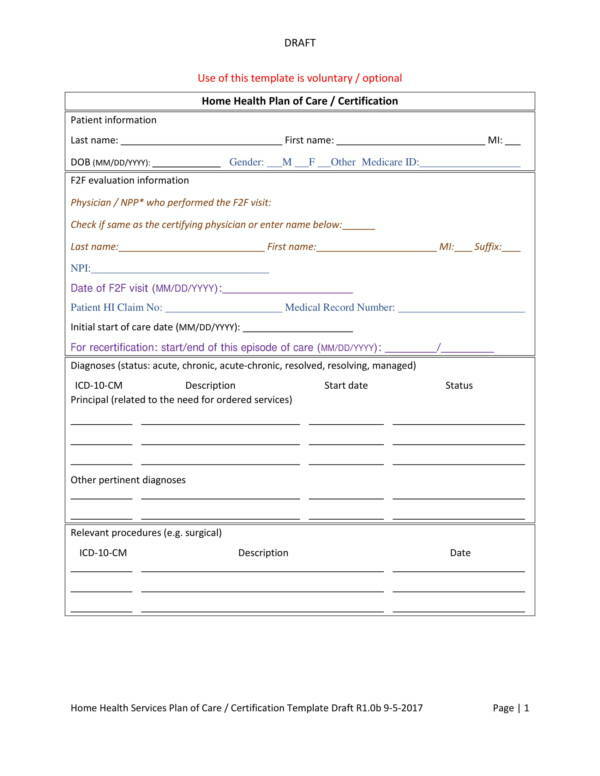 Patient care plans are documents that are used throughout the hospital setting, in wards, outpatient services and emergency rooms. It is where all the findings about the patient is recorded, including their personal information, laboratory tests requested and performed, the list of medications they have to take, the attending physician and the nurse on duty, as well as the care that every medical practitioner has provided them. The plan is updated before it is passed to the next staff on duty for the next shift, which ensures that the patient’s needs are attended to in a timely manner. Because most medical staff work in shifts, problems with miscommunication is common. But this issue has long been fixed and resolved with the proper use of a patient care plan. 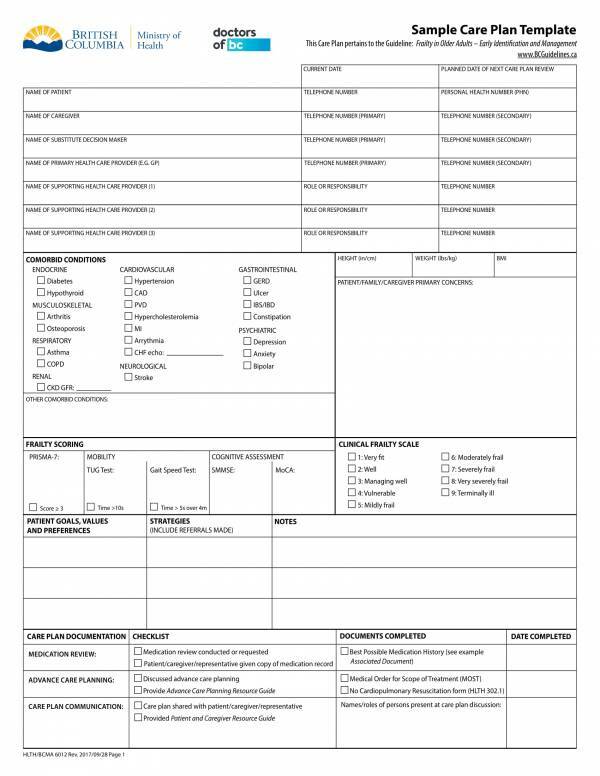 With a well-documented and updated patient care pan, the next medical staff to go on shift in the same are is made aware of the patient’s condition. A patient care plan is used to identify related problems that is then used to be able to come up with a solution to either reduce the problem or have it removed. It is used to document the care provided to the patient, which includes the medication administered, the doctor’s orders that has been carried out, the laboratory tests performed on the patient and their self-care needs. 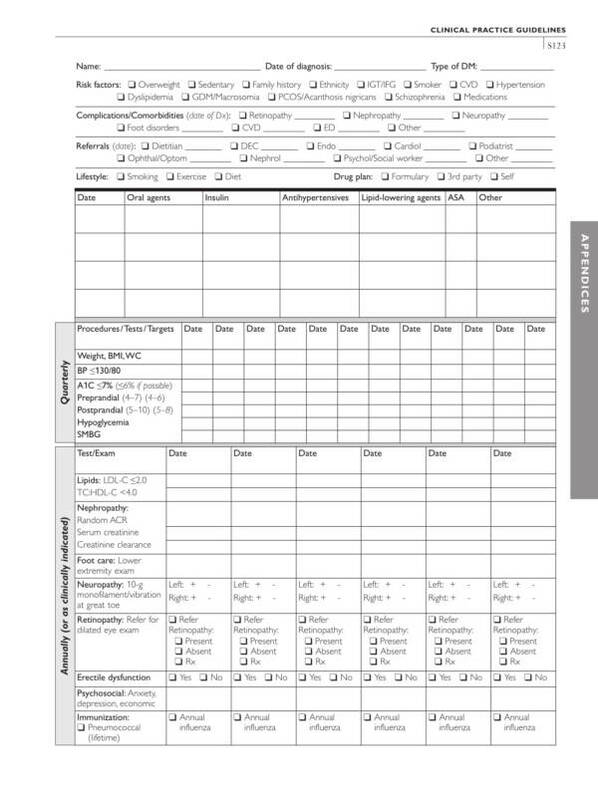 Patient care pans also provide a direction to the type of care provided or administered to a patient, and to provide standardized, holistic and evidence-based patient care. Through a patient care plan, the interventions done by the medical staff are recorded, which makes it possible to asses if the intervention was effective. In other words, it is used to record and measure the care provided. Patient care plans are also used so that continuous care can be provided to all patients, as well as to provide quality care, safety and compliance to care standards. 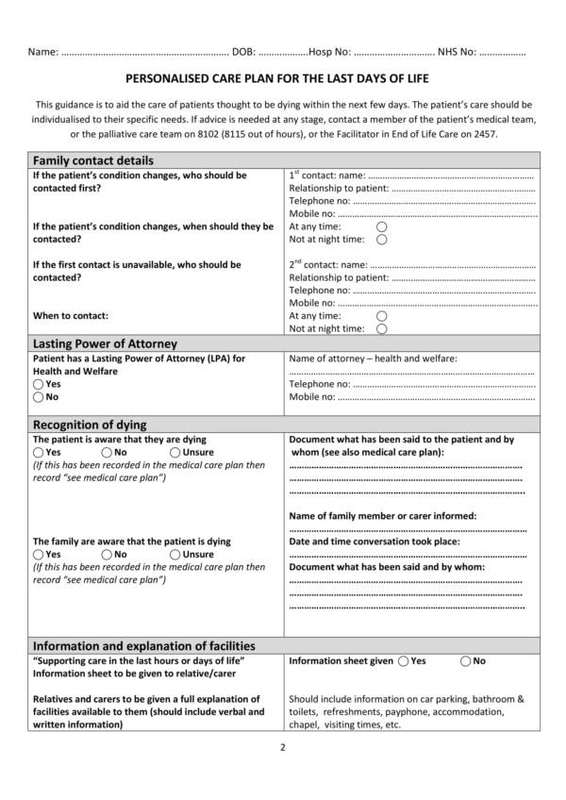 Since care plans include doctor’s orders and other medical orders, it is used by other medical staff as a guide to determine the things they need to do to be able to attend to the needs of the patient. It is also a means to tell which medical staff should perform the tasks or procedures ordered for the patient. 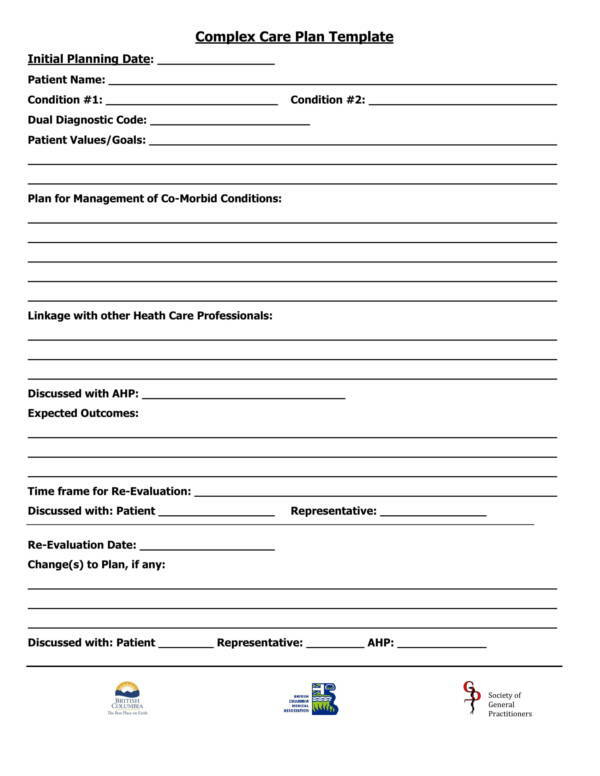 Have you seen a patient care plan before? Well, you can’t actually see them everyday, unless you are a medical practitioner, and they are just off limits to the public. 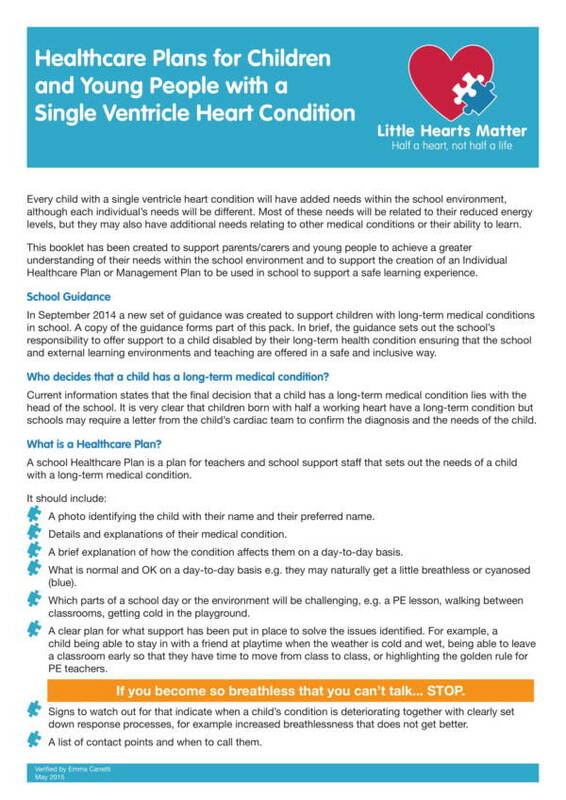 However, there are patient care plans and templates made available for medical and clinical practice that you may check out. 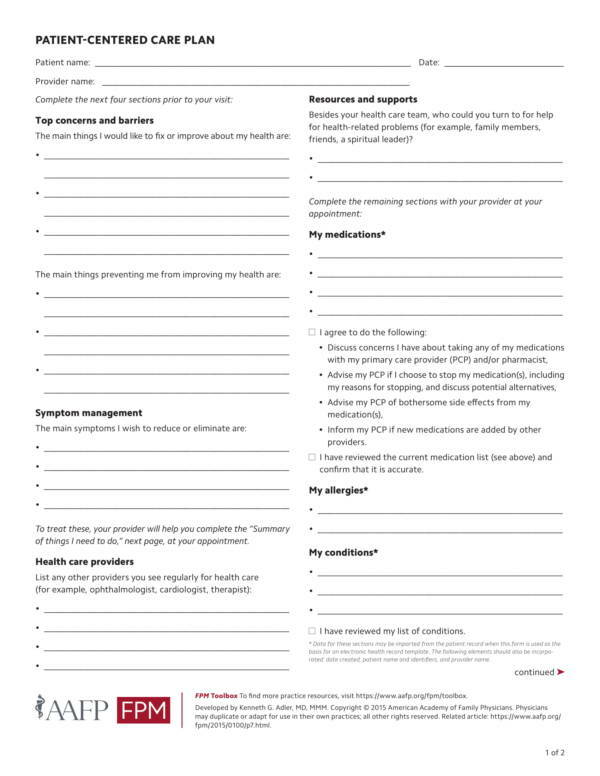 We have articles, like Care Plan Templates and Patient Note Samples where you can find them for free. There are five main components that make up a patient care plan and they are patient assessment, expected outcomes, interventions, rationale of interventions and evaluation. 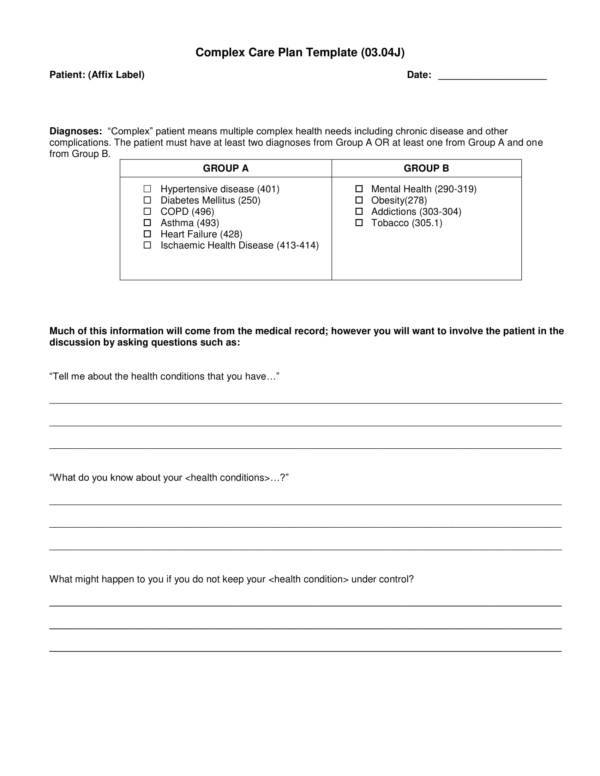 This is the first step needed before any medical practitioner can create a patient care plan. The patient’s condition is first assessed to determine how they are feeling. Information gathered during assessment is both objective and subjective. Here, the patient’s diagnosis, lab tests and medical reports are assessed, as well as the well-being of the patient. 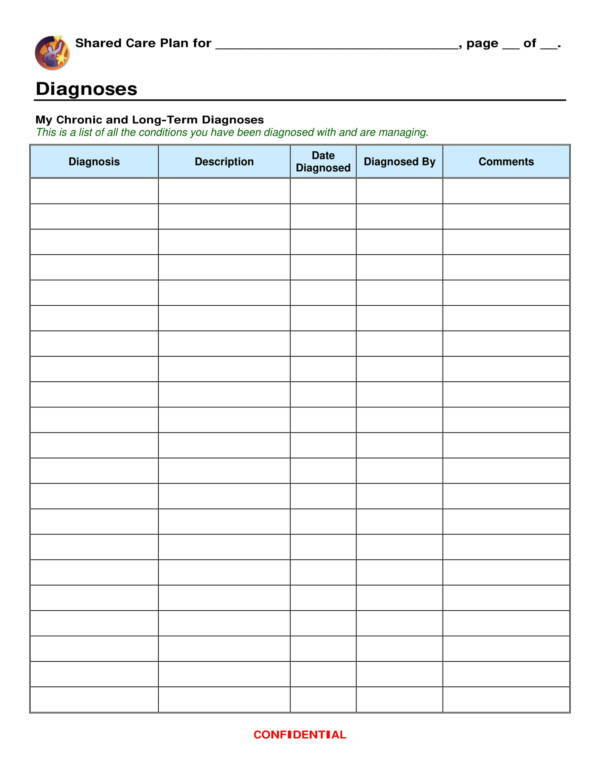 Identified issues or problems are documents which becomes the basis to create an effective and applicable care plan for the patient. Expected outcomes may either be for long-term care or short-term care, whichever is applicable to the condition of the patient or the identified health problems. This is where the care provider plans and writes the goal that they want to achieve for the type of care that they are planning to provide to the patient. It is important to set an expected outcome before actually planning the steps or intervention as it will give the care provider a clear view of what to do and where the care they are providing it headed to. Interventions or care interventions are the plans that are performed or done by care providers to help improve the condition of the patient they are taking care of. Care interventions in the hospital setting may include assisting patients self-care needs like doing sponge baths or changing clothes, assisting patients to mobilize or change positions in bed, providing health education about the side effects of the medication they are taking and how to properly handle them, and checking their vital signs regularly. The interventions provided are all based on the identified problems of the patient as well as the expected outcomes set by the care provider. This refers to rationale of the intervention. In every intervention listed in a care plan, the rationale or reason for doing so is included. This is so that the actions done to the patient can be justified and understood by all of those who are involved in the patient’s care. Say for example the intervention is assist patient in changing positions in bed. Bed ridden patients need to regularly change positions in bed to promote blood circulation and prevent bed sores. Assisting a patient in doing this will help them avoid accidents and allow them to easily position themselves comfortably. Evaluation is the last part of a patent care plan. Here, the care provider will evaluate if the care they had planned and provided are effective by observing the patient, asking them how they feel, and checking if there are any improvements to their condition before intervention was provided. Evaluating the care given to a patient is important because no one intervention is best for all types of patient and patient condition. If the first invention provided was not effective, then another plan can planned and implemented. This is done to improve their condition, if not to make them feel better. 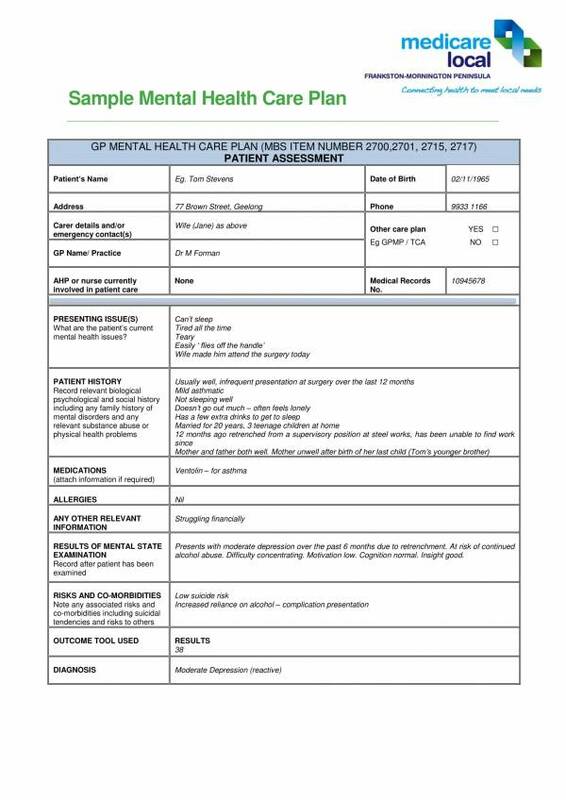 Hospitals and other care facilities have their own patient care plan format and they often use their own patient care plans. The components of a patient care plan may slightly vary depending on the institution using them. 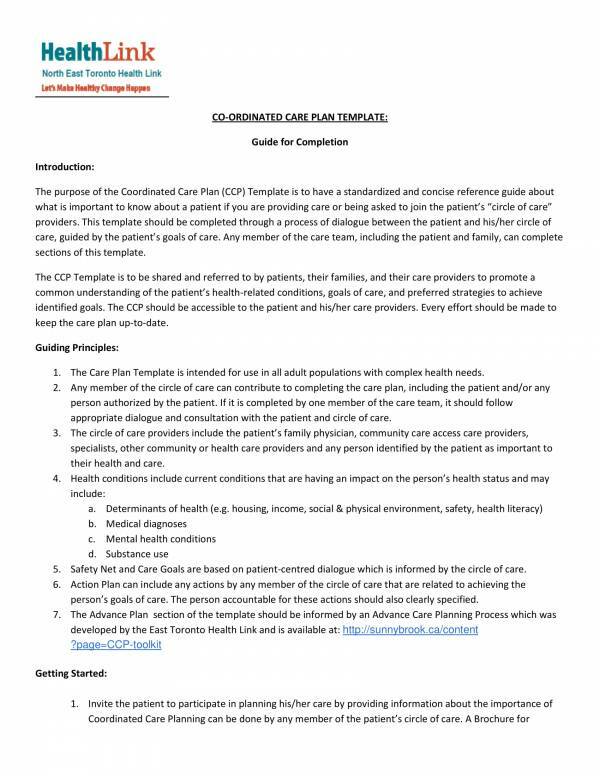 You can check out different patient care plan format and templates on our website, like Treatment Plan Samples & Template, Safety Plan Samples & Templates, and Work Plans in PDF. Who Makes Patient Care Plans? There are a lot of medical practitioners or medical staff in a hospital and you wonder who makes or writes these patient care plans? A patient care plan is all about providing the specific care that a patient needs and everyone who provided care to that patient should make a care plan. Doctors and nurses are primarily some of the few who makes patient care plans. 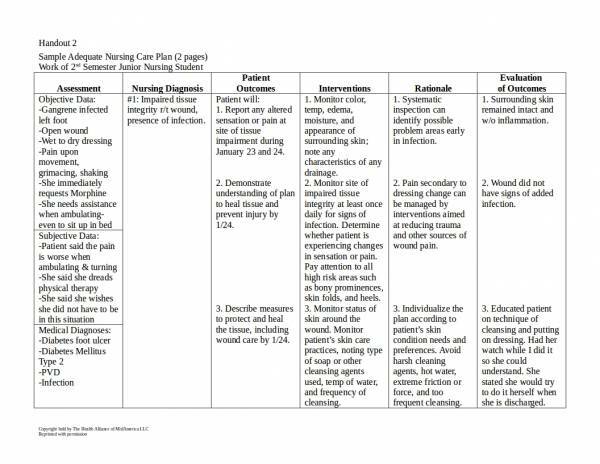 Nurses make use of nursing care plan while doctors have their own set of care plan for the patient. Other health care practitioners and medical staff who were able to provide care to the patient also takes note of the intervention they had provided. 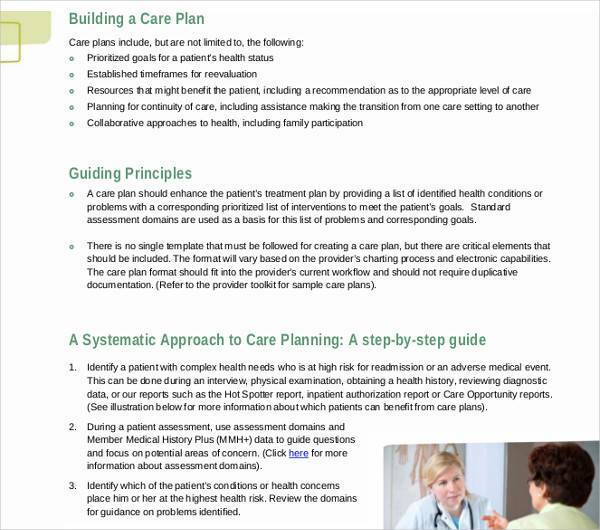 One of the goals of having care plans is so that there is a documentation to all of the things done to the patient. This documentation will serve as evidence that the right care has been administered, and so that one can be made responsible for their own actions. It is not really difficult to write a care plan, but it pays to know some tips that will help you in making one effective. Here are some tips that you can use to writ effective patient care plans. Plan ahead. 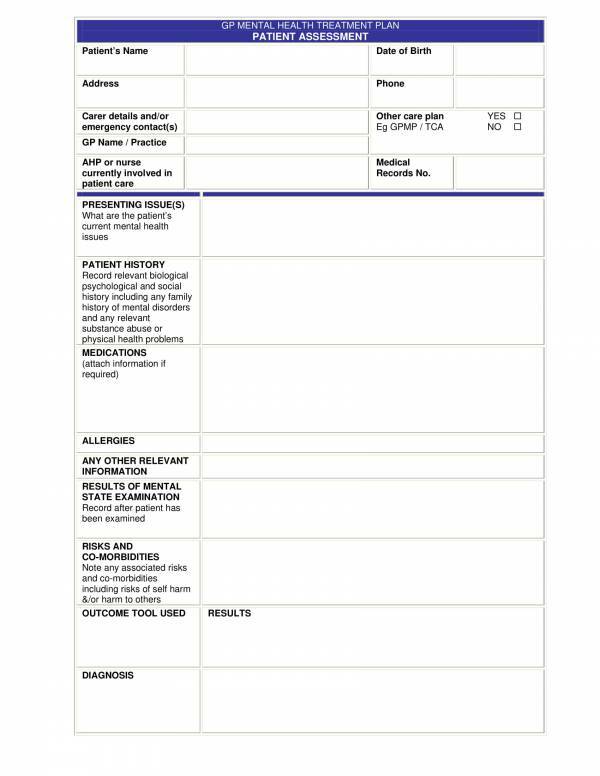 Patient care plans are written on a patient’s record sheet which is a very important document. So before you actually write anything on it, be sure that you have already planned it as there is no changing, deleting or removing once it is written. Prioritize care. What if the patient has a lot of problems? Then you need to attend to all of those problems by determining which care to give first. This is done by prioritizing the which conditions are urgent and which conditions are not fatal. As a care provider, one should know how to effectively prioritize a patient’s conditions. Write clearly and visibly. Make sure that your handwriting is visible and your sentences clear. Avoid using ambiguous words that may lead to any types of miscommunication. The aim of a patient care plan is to establish proper communication of care to prevent any harm to the patient. Use accepted terms. This refers to the words that are generally accepted and used in the hospital where you are working in or those universally accepted terms. Such terms are created to allow clear communication among all medical practitioners regardless of their field of specialization. Avoid abbreviations. Every medical profession have their own set of abbreviations. So if a doctor records an order or patient care in a certain abbreviation that a nurse does not know of, then there will be a problem carrying out the order. 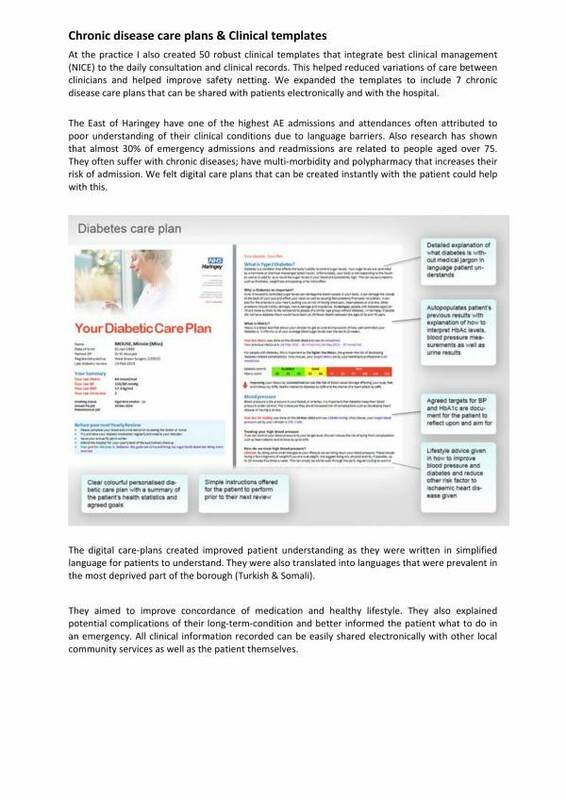 The full word should be written when writing a patient care plan so that those involved in the patient’s care will be able to read and understand it. Write and implement. Every time an intervention is written, it should always be implemented right away to ensure that there are no lapses in the care given. Writing and not doing anything can be taken against you as manifested by the patient’s conditions. Make updates. It is a must that the patient care plan be updated before the changing of shift. This is so that the next care provider to handle the patient would know what has been done and what they need to do. Avoid erasures. Medical records are often questioned and having a single erasure on your patient care plan will give you away to a lot of inquisition from your immediate head and other government regulating bodies. Erasures are seen as doing alterations that may possibly affect the patient’s condition. What other tips do you know or do you use to help you write an effective patient care plan? As you continue to write patient care plans, you will come across useful and wonderful tips that can help you improve the way you do things. We hop that you are able to find this article useful. You may also want to check out other related articles we offer on our website. To name a few are Business Plans Samples & Templates, Sample Marketing Plans, and Financial Plan Samples & Templates.